The SmartCoDe project proofed, that a low-cost, low-power microelectronic component developed in the project could enable Energy using and producing Products (EupP) to become part of a locally managed energy resource cluster. 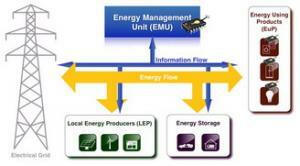 In such a local cluster EupPs can constantly be monitored. With the help of the aforesaid component they can further react on the basis of energy grid requirements as well as on forecasts of local energy generation and consumption. A roll-out analysis example of the SmartCoDe concept to only 10% of the 40,3 million households in Germany indicated an energy saving potential of 5,2 TWh per year and an additional potential of 1,6 TWh of regulating energy per year, i.e. energy that can either be used to balance the local energy consumption / production curve or that can be provided as a service to the grid operator for the purpose of grid stability. The latter, however, implies that a communication infrastructure will be established on lower grid levels. Which one leads to the first of two identified major show-stopper: the current low level grid does not possess the required communication measures to connect the end customer to the grid infrastructure. Low-level grid scheduling in the past has been executed mainly on the basis of experienced consumption data pattern. The setup of a communication infrastructure for the lower grid level, however, would require a significant investment by the grid operators, Return on Invest (RoI) therefore is a key issue. Since there is no indication today how such a potential investment could be regained, the authors of this report suggest regulating measures by national and EU bodies. The second show-stopper is the absence of standardisation when it comes to the integration of household equipment into DSM approaches. White goods provider all over the world are currently busy working on DSM-enabled household equipment, however, approaches are proprietary and there is almost no cooperation between manufacturers. A promising step in the right direction is the EC initiative eeSemantics, which focuses on the communication of smart appliances at information level in smart homes. The SmartCoDe project contributed to the initiative with its EupP classification. The required change from fossil to renewable energy generation is mainly approached with medium- to large-scale set-ups on the MW and GW level. Large scale approaches, however, require large investments, they are complex from a technical point of view (mainly the grid integration) and they often lack in public acceptance. Small-scale concepts on the other hand do not need a large financial investment. Also the technical challenges could be reduced significantly. Small smart energy clusters could be rolled out one-by-one, they could even be financed by cooperatives of citizen, keeping the creation of value local. When more and more of these clusters become available, the effect on the overall grid will continuously grow. The coordination of several clusters will even enhance the benefit and could be considered as the next step in the direction of Virtual Power Plants (VPP).